Frank Vignola (lead guitar); Vinny Raniolo (rhythm guitar); Gary Mazzaroppi (double bass) featuring Julien Labro (accordion). 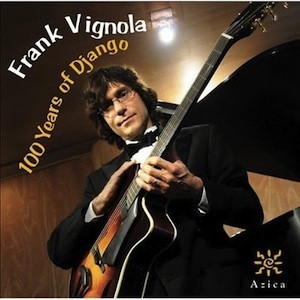 In celebration of Django Reinhardt’s 100th birthday, guitar virtuoso Frank Vignola, a leading proponent of Reinhardt’s gypsy jazz style of playing, has assembled a topnotch ensemble for a searing tribute to one of his earliest musical influences. © 2010 Azica Records, Inc.